It’s the acid in vinegar that makes it an effective cleaner. You may need to open windows to get the air flowing as sometimes vinegar can smell quite strong – but the smell won’t linger and you’ll have results to be proud of! Try cleaning your windows with a splash of vinegar added to a bucket of hot water – you’ll be amazed at the streak-free finish that you get. 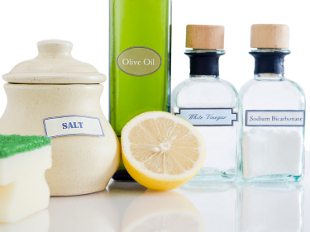 Vinegar is also great to use if you want to get rid of stubborn dirt in your kitchen. A vinegar solution, for example, will help to loosen tough oven dirt. Make up your solution by adding equal parts of water and white vinegar, then spray this on the dirt. Leave it for a few minutes before cleaning. You can also use vinegar to clean your toilet. This is an especially good use for the vinegar that you’ve used over and over again for descaling – instead of pouring it away when it’s time to replace it, pour the undiluted vinegar down the toilet bowl, just as you would with bleach. Leave it for at least 30 minutes before flushing away.